Frank E. Wetzstein was born on September 22, 1900 in Mandan. He was a businessman, a rancher and a long-time supporter of the Mandan Rodeo, especially during the 1940s and early 1950s. He also built and operated the Mandan Theater on Main Street as well as owned the Palace Theater for an extended period of time. In 1942, Frank headed the Mandan Rodeo Association, and tranformed the annual rodeo into a premier event. 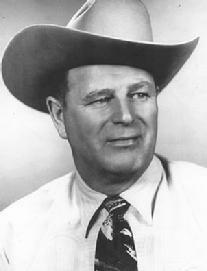 Under his direction, top cowboys like Toots Mansfield, Gene Ross and Casey Tibbs and the North Dakota "Six Pack" competed. Entertainment was headlined by national celebrities like Gene Autry, Rex Allen, Roy Rogers and Dale Evans, and Wild Bill Hickok. Frank's groundwork enabled the Mandan Rodeo to grow into what is now a 125+-year tradition as the annual July 4th Mandan Rodeo Days celebraion and the longest running rodeo in the U.S. Frank was a tireless supporter of the rodeo and also part owner, along with Gene Autry and Leo Cramer of Big Timber, Montana. He traveled the area, convincing cowboys to participate in the July 4th event. He brought some of the best rodeo performing cowboys to the Mandan Rodeo, which brought in crowds of 11,000 and more for a performance. He was also instrumental in starting a free Saturday matinee rodeo for children, allowing many underprivileged children to see the rodeo. Frank became known throughout the U.S. and Canada not only because for his rodeo promotion activities, but also for his ability as a rancher. Frank raised registered Quarter horses for years, and they were sought after by both working cowboys and movie stars. Frank operated two working ranches in ND where he raised Angus cattle. He was the first president of the ND Quarter Horse Association. Frank married Delilah Haggerman on July 19, 1929, in Mandan. Wetzstein who sold the Standard Oil Co. land at a bargain price for the refinery at Mandan, which has been an economic lifeline for the city. In 1949, Gene Autry flew his silver two-engine Beechcraft into Bismarck to perform at the rodeo across the river. The singing cowboy spent the evening at the Wetzstein ranch, where he even peeled potatoes for supper. Wetzstein sold Autry a young colt that had the same look and markings as Autry's horse, Champion. He died on November 25, 1976. Wetzstein's legacy lives on in Mandan's Rodeo.